Esri Story Maps is a web tool that enables you to combine the power of maps and narrative text to create engaging and inspiring stories to share with others. 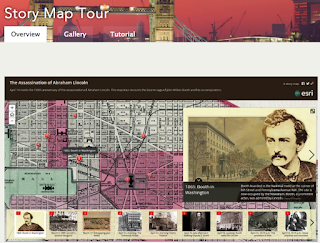 Besides maps, your stories can include places, locations, and geography. You can also embed a wide variety of multimedia materials to tell your stories. These include: videos, images, texts, shapes and many more. Create an in-depth narrative organized into sections presented in a scrolling side panel. As users scroll through the sections in your Map Journal they see the content associated with each section, such as a map, 3D scene, image, video, etc. Check out this page to view more story maps’ design options.